Last year, we saw a significant push in the true wireless earbuds space, as the improvements and innovations in the segment helped to deliver some truly astounding offerings. One of them was in fact the Jaybird Run, which impressively enough, beat out several other notable offerings to earn our award of the best true wireless headphones of 2017. 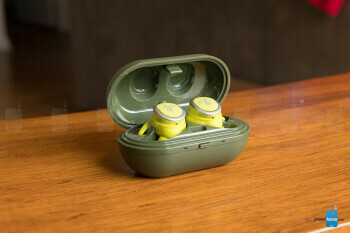 While it's not a direct successor, Jaybird has fashioned a variant of its popular earbuds – the Earth Day Special Edition. You're probably wondering what's new and what's different with this pair. Well, we'll have the full rundown below in our review! Designed after the original Jaybird Run, the Earth Day Special Edition is most notable for the green paint job it's sporting this time around – supplementing the existing jet and drift colors. The bright green colors are inspired by the lush landscapes of Jaybird's headquarters in Park City, Utah, which of course also emphasizes the Earth Day attachment of the earbuds. The green color is certainly bright, making the earphones distinguishable when they're worn even on the brightest days. Just as before, a silver accent outlines the earbuds. Beyond the new paint job, the design is completely identical to that of the original. 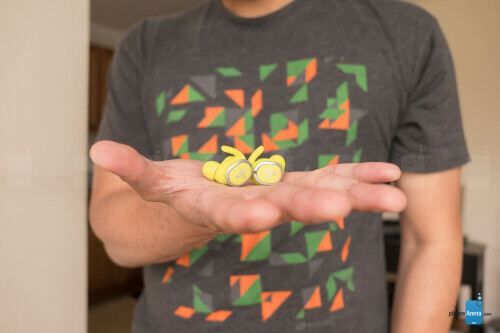 That's not a bad thing per se, especially when the fit of the Jaybird Run is snug in the ear – ensuring that the buds don't move much during workouts. Speaking of that, we managed to put the earphones through a run on a treadmill. Not only do the silicone ear tips help to establish a snug fit, but the fins on the earbuds also offer additional leverage in keeping them in place with activities that have us moving around a lot! And yes, they're sweat-proof and water-resistant just like before, so they'll handle even the sweatiest workouts. Matching its new paint job, the included charging case also receives a color change. This time, however, it's flaunting a forest green color that contrasts nicely with the bright colors of the earbuds. Since the earbuds cradle snuggly into the appropriate cutouts, placing them into the case and removing them is a relatively simple process. Once it's closed, the LEDs on the front of the charging case light up to indicate they're being actively charged – while the microUSB port on the back allows us to charge the case. The only gripe we have is that there's no level gauge to indicate the remaining battery level, but instead, the LEDs will turn red to indicate low battery. 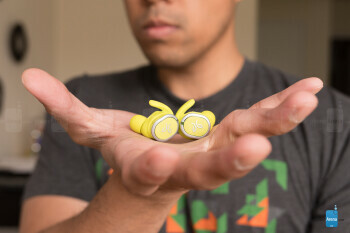 When setting up the Jaybird Run Earth Day Special Edition for the first time, they automatically go into pairing mode out of the box. 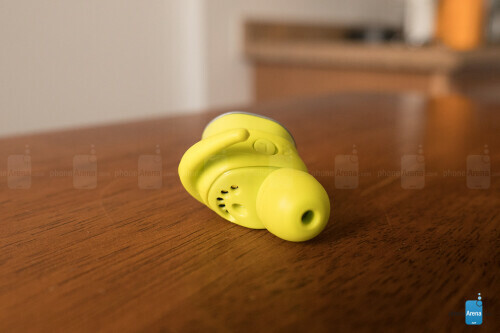 However, placing them into pairing mode can be simply done by long-pressing on the multi-function button on the right earbud, which is considered the "master" one. It's accompanied with a built-in LED light that continuously blinks, so you know that it's in pairing mode. 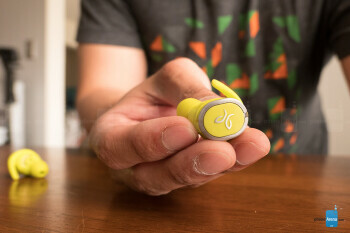 What made the Jaybird Run so loveable when we first came upon it was its ability to customize its equalizer settings through the accompanying Jaybird app, which is available for Android and iOS. Even though you can choose from a variety of signature presets, you can still adjust the equalizer to your particular liking – so that the tuning is just as you'd like! Therefore, if you're one for the lows, you can set the equalizer to focus on that. Comparing the Jaybird Run to more recent rivals, it pales next to the more robust package offered by competitors' true wireless earbuds. In just about the same price range, we have models that offer noise cancellation and sound amplification, which are two features that are becoming more commonplace. Yes, we're not shocked to not find either of those features here with the Earth Day Special Edition, but it's now going to be tougher to justify its package over its rivals. At least the app displays the remaining battery life of each earbud, which isn't something we find that often with others. 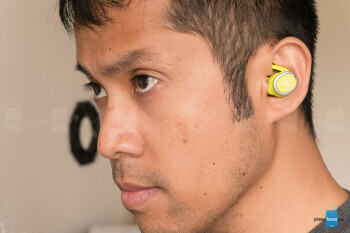 As we've mentioned already, the right earbud is regarded as the "master" or primary one. Unlike the last time, we didn't experience any dropped connections this time around, which was a complaint that some users expressed with the original. In our time using the Earth Day Special Edition, mostly at the gym, there was not one instance when the connection to one or both earbuds ever dropped – so we're happy to see the improvement here. However, we're still faced with latency issues that prevent us from properly watching video with our smartphone. Naturally, this isn't a problem for music listening, but the audio fails to sync properly to videos that are either streamed or locally played. This audio delay of sorts is unfortunate, just because it eliminates the Jaybird Run from being something practical for watching videos on the road. One set of controls has Google Assistant being initiated by pressing the button on the left earbud, while the right acts as the pause/play and accept/end call functions. Alternatively, the other set of controls simply has the left decreasing the volume, while the right increases it and acts as the accept/end call function. Unfortunately, there's still no way to customize these controls, which was something we were hoping to find by now through a firmware update, but that's not the case at all. We loved the sound quality back then, we still love the quality now. That's partly attributed to how robust the Jaybird Run sounds on the default setting, which of course can be further enhanced by tinkering around the equalizer settings with the Jaybird app. Therefore, if you're into the heavy beats, you can boost the lower audio ranges. At the loudest volume setting, the Earth Day Special Edition still delivers impressive power and audio. It never distorts or crackles, which is a testament to the 6mm drivers powering the earbuds. And even though it lacks noise cancellation, there's a fair amount of noise isolation when they're worn – so to that degree, it's able to eliminate ambient noise from getting in the way with our music! There's no major change to the battery life here, as the Earth Day Special Edition manages to clock in at roughly the same 3.5 hours as the standard model while continuously playing a track with the volume set to its loudest. By today's standards, this is very much in the average ballpark, as we've come across a pair that reached 6 hours! Back when the Jaybird Run was first released last year, this tally was largely considered above average, but not anymore. The included charging case extends its longevity, seeing that it conjures up roughly another two charges for the earbuds. 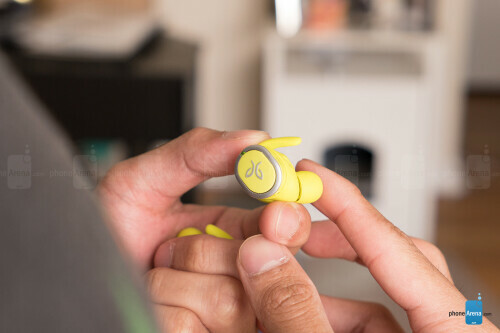 What's good, though, is that the Jaybird Run features its own fast charging – wherein 5 minutes of charging will produce roughly 1 hour of play time. If you're in a pinch, this is no doubt beneficial because it only requires a short charge time to achieve a decent battery level. In addition to sporting some Earth Day-themed colors, this special edition also comes with an eco-friendly packaging as well. Now, if we're to factor in how the only tangible difference here is the new paint job of the Jaybird Run, we were certainly hoping to find some sort of discount to them. Regrettably, that's not the case here, seeing that the Earth Day Special Edition of the Jaybird Run continues to be priced at $179.99. Maybe if the latency issue were corrected or battery life extended, the decision to retain the original's starting price would make more sense. 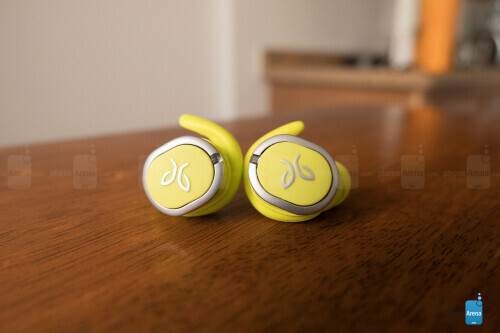 However, it makes for a tougher package to recommend over other, newer models that have been released since the original Jaybird Run. 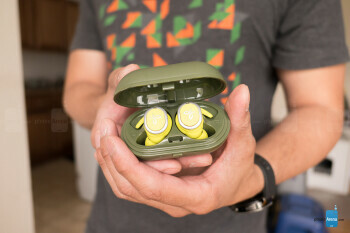 Nowadays, the sweet spot for most mainstream true wireless earbuds is around the $150 mark, and since these are a little above that, it's really difficult to choose them over others that feature longer battery life, noise cancellation, and some other additional features.